Confessions of a Campus Missionary: Sirak's March 2017 Update! My friends! I can't believe that we're already in April. We've only got a month left in the school year and I am completely blown away at what God has done this year. This year we're sending over 80 students to SICM (Student Institute of Campus Ministry) in Bellingham, Washington. SICM is a week-long campus ministry training experience that we send students who have proven themselves to be faithful, available, initiating, teachable, and that have a heart for God and others. These are students that we feel called to develop into leaders and SICM is a huge catalyst in the process of our leadership development. The SICM trip is not cheap. It is $800.00 total to attend and many of our students will be fundraising with the hope of being able to raise enough money. Please be praying that the Lord would open up doors and that they would be bold in asking others to partner with them to attend SICM. Our Dallas men's leader team! Every Monday night we all meetup and talk, pray, and seek the spirit on how we can serve our campus & students! I am so thankful and blown away by how the Lord has grown and developed these student leaders. It's because of these students that we are able to reach so many students. These are full-time enrolled college students who commit a year of their education to leading a small group and discipling their fellow students. On Saturday, April 1st, we'll be having our annual Spring Showcase SICM Fundraiser! I am going to be performing in a few of the closing numbers. In this photo, we are all rehearsing at Kurt Doty's (UNT FOCUS Alumna) residence. The first picture of our 2017-18 FOCUS Apprentices. These are all students who have graduated across our FOCUS campuses and are devoting a year of their life to full-time campus ministry. Please pray for them as they fundraise this season for the upcoming year, God is going to move so powerfully through these students! Our Dallas FOCUS staff (Peter-left & Sarah-right) are both talking to our students before we begin SSI-week, a week full of outreach and evangelism on our campuses. We brought in a group of students from Bellingham, Washington, who were on their spring break, to help us with a week long evangelism initiative called, "SSI Week" (Spring Student Impact). We housed them for the week and different families from our church body graciously offered to cook and host them for dinner during the week. Keith (right), one of our hosts during the week, teaching Will (left), one of our students from Bellingham, WA, how to use a bow. It was so cool to get to see our students loved and hosted during the week. I love that our church family has members that are willing to host and serve these students at no cost! Our SSI students from Washington came to Richland College two of the days during the week to help with outreach. We set up spikeball nets, threw around a frisbee, and walked around campus asking if any students needed prayer. It was such a powerful day to see how the Lord was working on our campus. Another picture of our outreach during SSI week. The weather was so gorgeous! We got to meet so many students and have great conversations with them about their spiritual journeys and how we can pray for them! Last week at FOCUS we had Dr. Rebecca Files, a professor in the accounting department, come and share with our students her faith and the impact she is having at UT Dallas! It's so encouraging to see the Lord work in the faculty on our campuses. 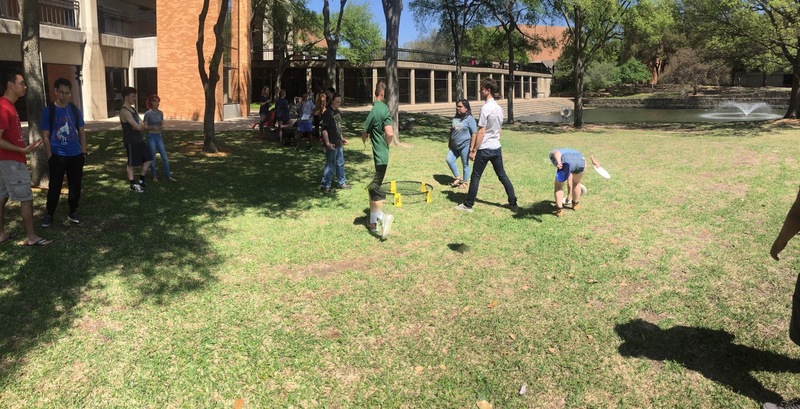 We had Richland FOCUS outside last week and the weather was perfect! Please be praying for our students as we wrap up the school year. Many of our students will be transitioning to new universities and re-starting much of their life. Please pray for there to be a community to love them and to be a place where they can serve wherever it is that they go! One of our students at Richland took a photo of me with his Snapchat app. Have y'all heard of snapchat? It is very popular with our students. I plan on getting in touch with all of you soon and please don't hesitate to contact me about anything you need prayer for! I'd love to catch up.